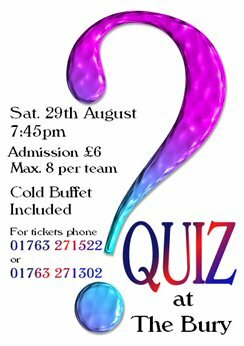 The club's first fundraiser of the season will be on Saturday 29th August at The Bury. Admission to our first general knowledge quiz of the season is £6 per person, with teams of up to 8 contestants allowed. Our quizzes are usually very popular, so get in quick to reserve your team's place. There will be a cold buffet too - the fun begins at 7:45pm. Contact Barry (01763 271522) or Chris (01763 271302) to book your tickets.